See What's Trending in the Auto Industry! If you had to choose between new rims or car window tinting which would you choose? Both add a visual appeal to your car, but besides from looking good, tinted windows have more benefits than just making your car look good. Safety is the first, and most vital, benefit that comes to mind. In addition to increasing safety, tints can also help to increase comfort by reducing glare, keeping your car cool on sunny days, reduce interior fading, and hide expensive equipment from would-be thieves. Here’s a quick breakdown on why you should get your car tinted right away. The added comfort is most noticeable on hot and sunny days when the sun is beating down on your car all day, with your car trapping all the heat inside in the same way the greenhouse effect traps heat inside earth’s atmosphere. Once you tint your car you’ll notice a significant difference in temperature in your cars interior when you go to sit down. Anybody who’s ever driven a car on a bright sunny day knows how annoying and even hazardous a strong glare can be when you’re trying to drive. Tint is pretty much the only option if you want to reduce glare. Darker shades will eliminate more glare than lighter shades. A proper window tint helps provide protection for your car’s interior upholstery. In fact, if you use a window tint, the life of your car’s interior will be extended up to 60 percent. This means your upholstery will look fresher and cooler for a longer period of time. And the reason this happens is because the window tint helps protect the interior against harmful ultraviolet rays that are emitted through sunlight. 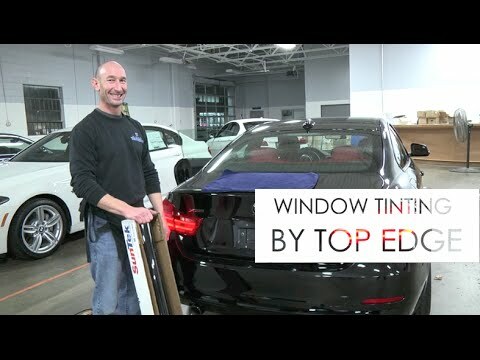 Aside from all the young drivers who like to black out their windows with the darkest tint they can, window tint is also a desirable aesthetic upgrade for many more adults and families. Putting a nice light-colored tint on any luxury car will give it a very noticeable classy appearance, while still reaping the benefits; this also pairs nicely with our Clear Bra (Paint Protection Film) service. Many people have sunglasses, sound systems, tools, and other valuable equipment in their car that can be easily noticed from the outside, making it an obvious target for thieves. For this reason more and more people have been tinting their cars to hide expensive items from outside eyes. So for people concerned about keeping their valuables safe tint is an effective deterrent. One of the most important advantages of window tint is ironically the most unknown. In car accidents, which may cause the windows to shatter, spraying the occupants with hundreds of tiny sharp pieces of broken glass, the strong adhesive tint film will help hold the cracked glass together preventing it from doing any damage. Any quality tinting film will be strong enough to hold the glass together in most accidents. So I ask again, if you had to choose between getting new rims or your windows tinted which would you choose?